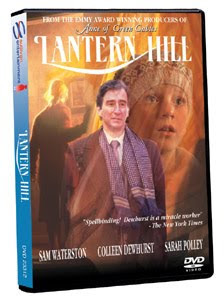 For years, literally, I've been watching Amazon in order to buy a copy of the movie, (Jane of) Lantern Hill. It is been consistently priced out of my league. Recently a friend mentioned that she was placing an order with Sullivan Entertainment and so I hopped over there and found a copy of Jane for $9.99! Now, that's definitely more in my price range! I ecstatically awaited the arrival of my long-awaited copy of Jane. (Plus, it came when I was in the throes of all-day sickness. I needed a tremendously happy distraction!) This movie definitely did not disappoint. I had seen this movie years and years ago but had forgotten much of it. I was finally able to re-read the book (linked to my review) last year after restoring it to my collection. (Jane seems to be the illusive LMM character whereas I am concerned!) But now I'm back on track. I re-read the book and re-watched the movie. Life is good. The movie, as you might suspect, is a bit different from the book. Just a tad bit. However, I think as with the movie Anne of Green Gables, Kevin Sullivan did a pretty good job holding to the spirit and the storyline of the original work and so I really didn't mind the changes that he ended up making to make the story flow on screen. Naturally, I always believe that the author tells the better story and I wish that film makers would let things stand as-is. However, this wasn't too bad. Several of the characters (like Aunt Irene) are spot on in their on-screen depictions. Others, like Jane's mother, are rather lacking. For example, at the beginning of the movie version we find Jane and her mother living apart from her grandmother. Jane's mother became ill and so she and her daughter are forced to move in with the grandmother. It's a minor tweak, but it's noticeable. Jane's mother is even more spineless on screen than in the original story, if that's possible. Jane and her father though are pretty much as I would imagine them to be. I think that's unfortunate. If Sullivan had stuck to Montgomery's story in its simplicity, then I would have had no reason to offer any cautions whatsoever with this film. As it is, if I had watched it when I was much younger, it would have creeped me out a bit. (I wouldn't have any issues showing it to a daughter, aged 12 at least.) It's a little darker than Peg. Still, not so dark and removed from the original storyline as to be a put off. I liked this movie. A lot. If you are going to order it for your home collection, I heartily recommend Sullivan Entertainment which is a cheaper more direct route than Amazon. If you are going to watch it with your kids, and are a more conservative viewer, I'd say watch it first and have a discussion about this particular aspect with younger viewers. If you are a terribly ecstatic Lucy Maud Montgomery fan, I wouldn't say to avoid it. (I would say to avoid the Emily series.) Jane holds true for the most part and brings to life another cherished Montgomery character. On the whole, I can't complain - I can only enjoy. I haven't read the book yet...so I'm not prepared to watch it, but I did like your review. I always know I can trust you! It's been YEARS since I've watched Anne. Is "The Continuing Story" the one to avoid(bc it doesn't follow the books)? I have the first video of Anne on my Christmas list...and didn't want to add the wrong one. Thanks! Seriously, I just skimmed this post b/c I haven't read the book yet. I think I will order it today! I love love love this movie - I think Sam Waterston as the Dad is spot on perfect. It's been forever since I've watched this movie. I may need to add that to my one-of-these-days wish list. Annette - YES! The "Continuing Story" is the one to AVOID like the PLAGUE that it is!!!! May have to do that for your LMM challenge in January!! I still need to read this book but would like to see this film, too.